Former White House comms directors under Presidents Clinton, Bush, and Obama shared lessons learned at the PR Council Critical Issues Forum on Friday. NEW YORK: Now that Hope Hicks has taken up the mantle as White House communications director, she joins the ranks of the select communicators who held that same role. At the PR Council Critical Issues Forum on Friday, three previous White House communications directors and one former press secretary offered Hicks some advice at the end of her first week on the job. "Do the job, don’t try to do someone else’s job," said Don Baer, CEO of Burson-Marsteller and former comms director for President Bill Clinton. "The communications director job is a strategic job. It’s about somebody who has a passion for anonymity and wants to be behind the scenes, pulling together as many different threads as possible and working with the press secretary, speech writers, and policy advisers to move something forward in a positive way." Anita Dunn, MD at SKDKnickerbocker and former comms director for President Barack Obama, urged Hicks to remember she works for the taxpayers, saying, "At the end of day, it’s a much bigger job than staffing the president. You’re paid by the U.S. government, not paid by the president. You’re working for the taxpayers." 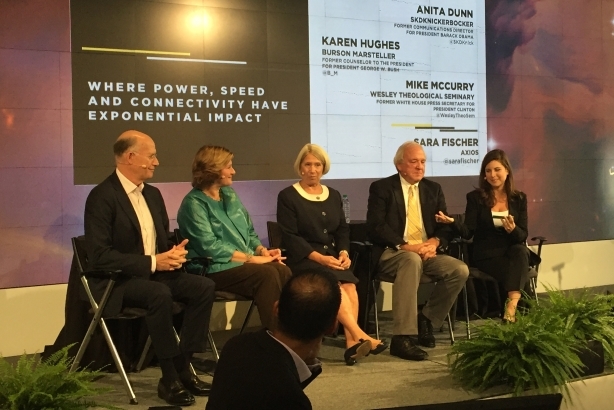 Karen Hughes, global vice chair at Burson and comms director for President George W. Bush, offered some practical advice: "Figure out three big things you want to accomplish in the next year. Go to the chief of staff and figure out how we need to use the President's time, actions, and words to get it done." Perhaps the biggest hurdle for the current White House comms team to overcome is President Donald Trump’s personal Twitter, where he often goes to vent or share his thoughts with followers -- sometimes contradicting official statements. The panelists agreed Twitter was an extremely powerful tool during the election, but it could be used more effectively now that Trump is in office. "You can’t argue with success," Hughes said. "He used it very effectively in the campaign, but as president he could be using it more effectively to advance his policy agenda." Dunn, who also headed communications for Obama’s 2008 campaign, remembered running communications for the then-cutting edge campaign -- which used text and email to reach supporters -- and how that has changed. "For a communicator, to be able to reach huge numbers of people quickly and directly with facts, I would’ve loved to have Twitter in this way when I was in the White House," Dunn said. The White House comms vets suggested that the Trump admin has struggled with his communications in several ways. Credibility and creating an environment conducive to its messaging are two areas the panelists called out. "Maintaining credibility is absolutely vital," said Mike McCurry, former press secretary under President Clinton and current professor at Wesley Theological Seminary. "As communicators, we’re only as good as the people we communicate for. It’s not about you – it’s about your credibility and what you're willing to do to keep it. We’re getting some moral lessons on that in this administration."